Also known as Ronaldsway Airport – or Purt Aer Vannin in the Manx tongue – Isle of Man Airport is one of two main gateways to the island. Located close to the capital, Douglas, it has scheduled services to the UK, Ireland and the Channel Islands. Our guide to the airport is a useful resource for travellers, with information regarding terminal facilities, public transport access and nearby accommodation options. The airport information desk (tel: +44 1624 821 600) is located in the main terminal hall. It also provides local tourist information. From Douglas, follow the main A5 road southwest towards Castletown. This road directly passes the airport; follow the signs to the terminal via the dedicated roundabout exit. The total drive time from central Douglas to the airport is approximately 20 minutes. Isle of Man Airport is located near Castletown, some 14km (8.5 miles) southwest of Douglas, the island’s capital. Bus: Bus services 1, 1A and 2 operate daily between Douglas, the airport, Castletown and Port Erin. Buses 10, 11, 11A, 12 and 12A follow this route during evening and early morning. Additionally, route 8 runs Mon-Sat from the airport to Peel and intermediate destinations. Journey time to Douglas is 25 minutes, to Peel 30 minutes, and to Castletown 7-8 minutes. Taxi: Taxis are available immediately outside the terminal building. Fares are displayed on a board by the taxi rank. From March to October, it is possible to reach the airport via the historic Isle of Man Steam Railway (tel: +44 1624 662 525; www.gov.im). There is a request stop (Ronaldsway Halt) within a few minutes’ walk of the terminal – it is necessary to hail the driver in order to board or to inform the guard in advance where you wish to alight if travelling to the airport. Trains operate four to six times daily between Douglas and Port Erin via Castletown. An ATM is available in the main terminal entrance area. There is a self-service restaurant on the first floor of the terminal, and a bar and café in the departures lounge. There is a newsagents adjacent to the restaurant, which sells newspapers, magazines, books and postcards. There is another shop, selling souvenirs, in Departures. Duty-free is not currently available as there are no flights to non-EU destinations. Lost property is administered by Airport Security (tel: +44 1624 821 612). Other facilities available at Isle of Man Airport include baby-changing rooms and a runway viewing area. There is a small business centre offering services such as photocopying and fax. There is also a small meeting room (tel: +44 1624 821 601) that can be booked in advance. More extensive conference and meeting facilities are available in the main Douglas hotels. Free Wi-Fi internet access is available in the departure lounge and buffet area of Isle of Man Airport. There is a letterbox near the information desk and public telephones can be found throughout the terminal. The airport is accessible to the physically disabled. In the terminal there are disabled toilets, wheelchair-height telephones and a loop system to assist with PA announcements. There is a designated waiting area in Departures for wheelchair users and spaces in the short-stay car park closest to the terminal are available at long-stay rates for disabled badge holders. Any passengers who may require additional assistance are advised to contact their airline before travelling. 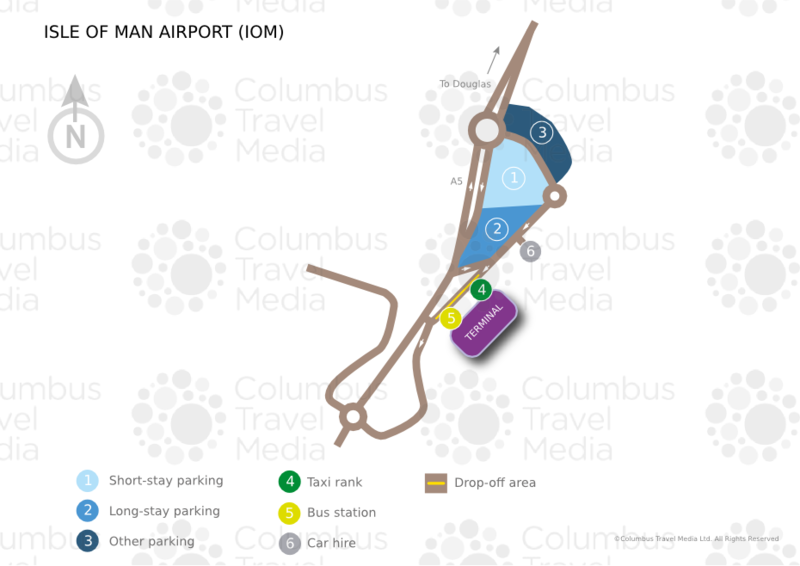 Both short- and long-stay parking is available close to the terminal, with better rates generally available in the long-stay area. Athol Car Hire, Isle of Man Rent A Car (agents for Hertz, Europcar, National and Thrifty) and Mylchreests Car Rental (representing Avis) have offices at or near the airport.